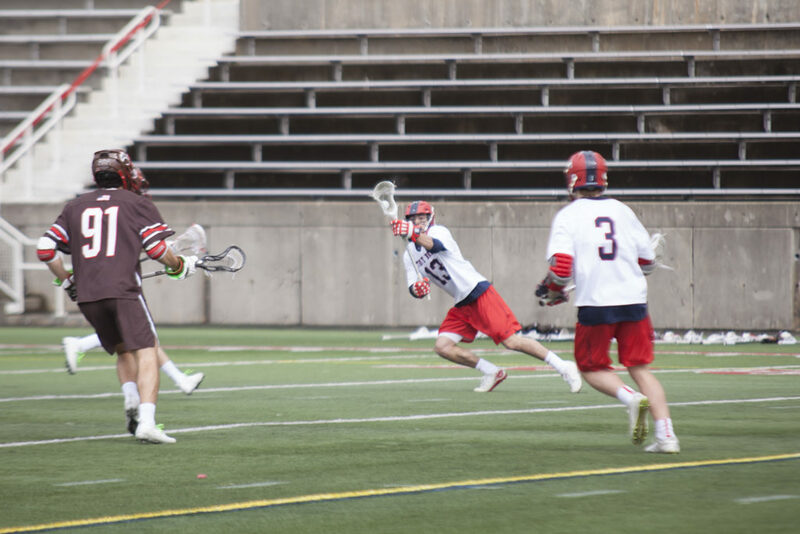 Stony Brook Men’s Lacrosse never took a lead against the Princeton Tigers in its 16-8 defeat on Saturday, April 7 at Class of 1952 Stadium in Princeton, New Jersey. The team begins its most important part of the season this week, facing all America East competition the next three weeks to wrap up the year. The Seawolves are currently third in the conference standings and are just two games out. Princeton held control on both sides of the ball, outshooting Stony Brook 41-26 and gaining the upper-hand on ground balls 32-23. The Tigers held a 10-3 lead heading into halftime off a last-second goal by freshman midfielder Chris Brown, extending the Seawolves’ record to 0-7 when trailing at the half. Sophomore attackman Connor Grippe got things going for Stony Brook with a goal with just under nine minutes left in the first period, but Princeton already possessed a three-goal lead. Freshman midfielder Mike McCannell notched his eighth goal of the season about three minutes later off an assist from freshman defender Patrick Kaschalk to put his team within one. The one-goal deficit was the closest the Seawolves got to tying the matchup. The Tigers initiated an offensive rally, scoring three more in the first period and four in the second period. Unfortunately for the Seawolves, the attack didn’t stop there. The Tigers went on to score two goals in the third period on just three shots on net and four more goals to cap off the onslaught. Stony Brook’s leading goal-scorer, sophomore attackman Chris Pickel, Jr., led the way offensively, notching his 15th and 16th goals of the season in the second half. Kaschalk had two points on the day as well, including a goal in the first period off a feed from freshman attackman Jack Walsh. With the assist, Walsh extends his active point streak to nine games. Freshman defender Devin O’Leary stood out in the matchup defensively, accounting for three ground balls along with Kaschalk. Sophomore midfielder Harrison Matsuoka played a strong defensive game as well, picking up two ground balls and a single caused turnover. Sophomore midfielder Tom Dugan and sophomore attackman Cory VanGinhoven also registered one caused turnover each. The team’s issues at goalkeeping were exploited, as sophomore goalkeeper Michael Bollinger let up 10 goals on 15 shots faced. Bollinger saved five shots in the first half before being pulled at halftime for senior goalkeeper Brandon Maciejewski. Maciejewski also struggled against the Princeton offense, letting up six goals on 11 shots on goal. The team’s overall save percentage was 39 percent, their fourth-lowest on the year. The Seawolves’ overall record drops to 4-7, yet they still possess a 2-1 conference record. The team will finish up its regular season with three straight games against America East competition, starting off with the Vermont Catamounts on Saturday, April 14 at Kenneth P. LaValle Stadium at 2 p.m. The Catamounts are currently riding a three-game winning streak, scoring a total of 35 goals in the span.